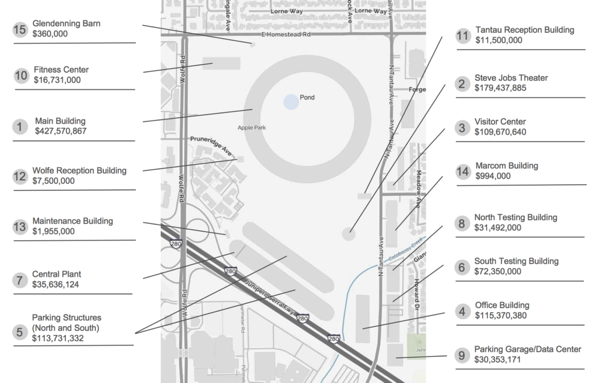 The folks over at BuildZoom have estimated the minimum costs for each of the 15 major structures at Apple Park, the iPhone maker’s new multi-billion dollar headquarters in Cupertino, also known as the Apple “Spaceship” Campus 2, and has ranked them by descending value, all the way from the $427 million Spaceship to the $360,000 storage barn, giving you a good idea of what it would cost to build the Apple Park. Using their Open Building Permit Repository, the researchers at BuildZoom have broken down the project into a list of the most notable building permits. Starting with the main building, aka the Spaceship, the 2.8 million square-feet donut-shaped building with a capacity for 12,000 employees and 8,255 parking spaces, would alone cost a whopping $427 million dollars. The underground Steve Jobs Theater, which seats 1,000 people, costs north of $161 million, whereas the Visitor Center, which includes a visitor reception area, a display area, and a cafe on the ground floor with three levels of underground parking, costs $26 million. While the values mentioned may be estimated or rounded, the source notes they do not include permits for demolition work, temporary structures, or other public infrastructural improvements. 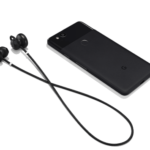 To learn more, check out the source at this link.